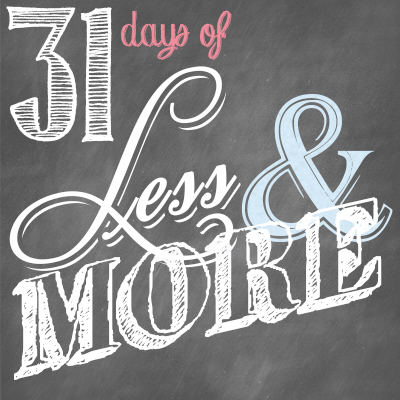 This is Day 12 of our 31 Days of Less & More challenge. To read all the posts in order, start with Day 1, then visit the Overview Page to see the entire series. We’ve made it one-third of the way through our 31 days, and today marks a shift into Part Two of this series, which will focus on creating less stress but more peace in our lives. What better place to start than social media? Now don’t get me wrong, I actually adore love social media! I could happily spend hours perusing the many wonders of Pinterest, collecting recipes and craft ideas and tips of all kind. I love keeping up with all my friends and family on Facebook, and I’ve found that participating in Facebook groups can be a great way to connect with colleagues or people who are striving for the same goals. And who doesn’t love Instagram? Even my seven-year old is hooked! No, the problem isn’t really social media itself, but often the amount of time that we devote to it. Modern culture makes it all too easy to substitute superficial Facebook friendships for real life relationships. Even worse, we maintain online “friendships” or worry about trying to impress people we often don’t even like. Even worse, we get annoyed or depressed when our life doesn’t stand up to the Pinterest standards of perfection, or when the status updates from those same people rub us the wrong way. Why? Set the timer. I try to give myself 15 minutes in the morning for browsing Facebook & another 10-15 minutes in the evening, and I set similar limits for Pinterest. When the time is up, I get off, no questions asked. At least in theory. Turn off all alerts & notifications. This is such a simple solution but can make such a big difference! I found that as soon as I stopped being alerted anytime I had a message or a friend request or I was being tagged, the temptation to go and look simply went away. I also turned off all group board notifications, which allows me to participate on my own schedule, not someone else’s. Yes, I might miss an interesting conversation every once in a while, but that is a risk I am willing to take to maintain a little sanity. 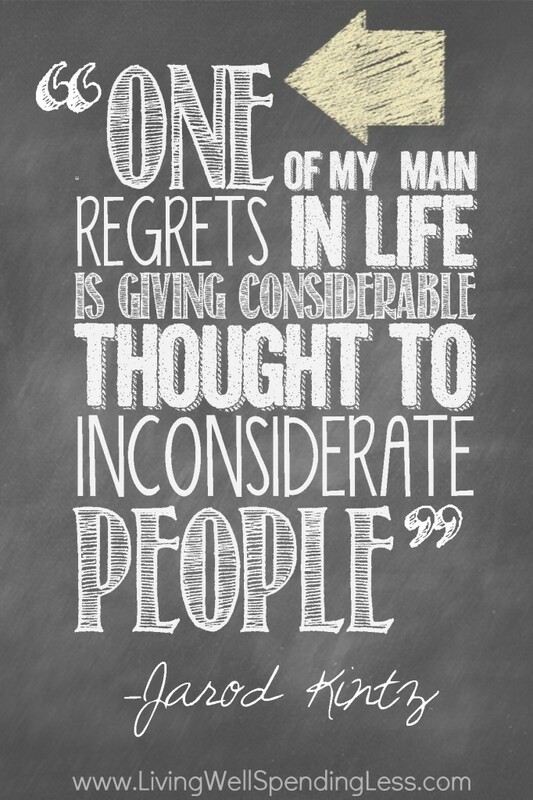 Be selective. The last time I checked there were no awards for the number of Facebook friends you have or the number of groups you belong to. Choose quality over quantity and limit your friends and groups to those people you would actually want to spend time with. On my personal page, I don’t usually accept friend requests from anyone I haven’t met in person. I have also unfriended a few people and unjoined groups for a variety of reasons. I promise that you will never regret the time you didn’t spend on Facebook. Spend some time with a real-life friend instead! Be sure to read Edie’s corresponding post, More Friendship. Do an internal Facebook audit. Are there so-called friends in your feed who are driving you crazy or causing you stress? Un-friend them. Remove yourself from groups you’re not interested in, un-like any pages you are no longer interested in, and turn off all notifications. Then do the same for any other social media networks you participate in. Now, spend some time thinking about the people in your real-life circle. Think of two people that you love and respect that you’d like to cultivate deeper friendships with and write them down. Pray for that person, invite them for coffee, send notes of encouragement or short texts or emails. Do you ever spend too much time on social media? What are some ways you can connect with your real life friends instead? This is such good advice. Just the other day, I turned off all my notifications from facebook. I no longer receive all those emails which make me want to immediately log on and check things out, and as a result, I’m on facebook so much less! I did the same with Pinterest awhile back as well, and I spend so much less time on there. I used to get on to look up one specific things, and then ended up randomly browsing the humor board for far too long, but no more! Oké, I ‘ll try it with a timer! One of the best things I did was download the stay focus app from Chrome were I could set time limits for certain sites, Facebook and Pinterest included. It has helped me so much being intentional about the time that I am able to spend online. But I do need to go through my friends and delete some, especially those that I haven’t even interacted with since high school! Great reminder today, thanks for sharing! I need that app! Thanks for the suggestion. Yes, I frequently fall prey to going online with a specific goal but getting distracted by all the other temptations (Pinterest) out there. Setting a time limit would be a big help for me. Great post! I agree and struggle with this, as many of us do. I have done a friends audit on FB several times and feel like it’s basically down to close friends, family, and a handful of less close friends but those I actively want to stay in contact with. It works for me right now. I’ll be taking your timer and notification settings advice – good ideas! Boy…am I super convicted. I’m a few days behind on here, but God’s timing is perfect. Today was exactly when I needed to read this post. I am going to turn off my notifications and I am going to let some of my friends know that I won’t be readily available all day long. My husband will be overjoyed. I did a facebook friends audit awhile ago, and periodically do so, so the people I’m keeping track of are the ones I really care about. It is freeing and makes a big difference! Nice article Ruth…! Just to the Point.As I am working I basically dont get time for Social Media.But anyways I practice these things you mentioned except Notification. I’ll definately do that. Also ,I am planning to quit my job and planning to be a home maker full time. :). Thanks so much for this post. I needed a great reminder to help me resist the temptation!